Bee venom, a powerful product from honey bees contains many components with incredible potential. This study reinforces recent studies which found bee venom therapy positive for treating Parkinsons, as well as other conditions, such as ALS and Alzheimer's Disease. Stockholm, Sweden — Both acupuncture and bee venom acupuncture showed promising results in improving symptoms in patients with Parkinson's disease in a new small study. The study was presented at the recent International Parkinson and Movement Disorder Society (MDS) 18th International Congress of Parkinson's Disease and Movement Disorders. Senor author of the study, Seong-Uk Park, MD, Stroke and Neurological Disorders Center, Kyung Hee University Hospital, Gangdong, Seoul, Korea, explained to Medscape Medical News that studies suggest acupuncture might be beneficial in Parkinson's disease by increasing the efflux and turnover of dopamine. It has also been suggested to enhance the benefits of L-dopa and alleviate the adverse effects. Commenting on the results, Louis Tan, MD, National Neuroscience Institute in Singapore, who was not involved in the study, said, "The results showed significant improvement of movement outcomes with acupuncture and bee venom acupuncture. These results are important as it has been found that up to 70% of patients in some countries use complementary therapies for the management of Parkinson's disease." In the study 43 patients with Parkinson's disease were randomly assigned into 3 groups: acupuncture, bee venom acupuncture, or control. Acupuncture involved insertion of needles into 10 acupuncture points at a depth of 1.0 to 1.5 cm. Needles were rotated at 2 Hz for 10 seconds and the position was maintained for 20 minutes. The treatment was repeated twice a week for 8 weeks. During the trial, 14 patients were excluded, leaving 35 patients (13 in the acupuncture group, 13 in the bee venom acupuncture group, and 9 in the control group) for analysis. Baseline characteristics did not significantly differ between groups. Participants in the bee venom acupuncture group showed significant improvement on the Unified Parkinson's Disease Rating Scale (UPDRS) (total score, as well as parts II and III individually), the Berg Balance Scale (BBS), and the 30-meter walking time. In the acupuncture group, the UPDRS (part III and total scores) and the Beck Depression Inventory (BDI) improved significantly. The control group showed no significant changes in any outcome after 8 weeks. No serious adverse events from the bee venom or acupuncture treatments occurred. One patient in the bee venom group reported itchiness. This finding is consistent with other studies worldwide, confirming the anti-cancer properties of propolis. In this case, they've identified 3 compounds (of the 300 found in propolis) which triggers cell death in human colon cancer cells. The phytochemicals are derivatives of cinnamic acid - Artepelin C, Baccharin & Drupanin. Propolis cinnamic acid derivatives have a number of biological activities including anti-oxidant and anti-cancer ones. In this study, we aimed to elucidate the mechanism of the anti-cancer activity of 3 representative propolis cinnamic acid derivatives, i.e., Artepilin C, Baccharin and Drupanin in human colon cancer cell lines. TRAIL/DR4/5 and/or FasL/Fas death-signaling loops and by increasing the expression level of miR-143, resulting in decreased expression levels of the target gene MAPK/Erk5 and its downstream target c-Myc. These data suggest that the supplemental intake of these compounds found in propolis has enormous significance with respect to cancer prevention. Monofloral honeys are undergoing numerous studies, as researchers determine the importance of their phytonutrients. Honey in general has similar properties, but the phytochemical component in Thyme honey is now identified to deliver that extra punch in the healing process. We have previously demonstrated that Greek thyme honey inhibits significantly the cell viability of human prostate cancer cells. Herein, 15 thyme honey samples from several regions of Greece were submitted to phytochemical analysis for the isolation, identification and determination (through modern spectral means) of the unique thyme honey monoterpene, the compound trihydroxy ketone E-4-(1,2,4-trihydroxy-2,6,6-trimethylcyclohexyl)-but-3-en-2-one. We investigated the anti-growth and apoptotic effects of the trihydroxy ketone on PC-3 human androgen independent prostate cancer cells using MTT assay and Annexin V-FITC respectively. The molecular pathways involved to such effects were further examined by evaluating its ability to inhibit (a) the NF-κB phosphorylation (S536), (b) JNK and Akt phosphorylation (Thr183/Tyr185 and S473 respectively) and (c) IL-6 production, using ELISA method. The anti-microbial effects of the trihydroxy ketone against a panel of nine pathogenic bacteria and three fungi were also assessed. 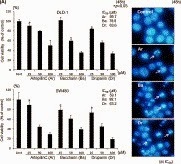 The trihydroxy ketone exerted significant apoptotic activity in PC-3 prostate cancer cells at 100μM, while it inhibited NF-κB phosphorylation and IL-6 secretion at a concentration range 10-6-10-4M. Akt and JNK signaling were not found to participate in this process. The trihydroxy ketone exerted significant anti-microbial profile against many human pathogenic bacteria and fungi (MIC values ranged from 0.04 to 0.57mg/ml). Conclusively, the Greek thyme honey-derived monoterpene exerted significant apoptotic activity in PC-3 cells, mediated, at least in part, through reduction of NF-κB activity and IL-6 secretion and may play a key role in the anti-growth effect of thyme honey on prostate cancer cells. This exciting study reinforces previous studies with humans, which found other positive results from consuming royal jelly, even in shorter duration. These findings are very important for those concerned with Alzheimer's and other age-related diseases. The message is clear - consume royal jelly, it's a brain booster! Royal Jelly (RJ) is a bee-derived product that has been traditionally used in the European and Asian systems of medicine for longevity. RJ has various pharmacological activities that may prevent aging e.g., anti-inflammatory, anti-oxidative, anti-hypercholesterolemic and anti-hyperglycemic properties. To evaluate the behavioral and neurochemical effects of long-term oral, previously chemically analyzed, Greek RJ administration to aged rats. RJ powder was given to 18-month old male Wistar rats (50 and 100mg of powder/kg b.w./day) by gastric gavage for 2 months. 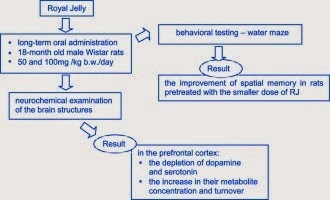 The spatial memory was assessed in the water maze and next the level of neurotransmitters, their metabolites and utilization in the selected brain regions were estimated. The improvement of memory in rats pretreated with the smaller dose of RJ was observed compared with controls. In biochemical examination mainly the depletion of dopamine and serotonin in the prefrontal cortex along with an increase in their metabolite concentration and turnover were seen. Better cognitive performance in the old animals using a non-toxic, natural food product in the view of the process of the aging of human population is noteworthy. Our results contribute towards validation of the traditional use of RJ in promoting a better quality of life in old age. Acacia honey is a natural product which has proven to have therapeutic effects on skin wound healing, but its potential healing effects in corneal wound healing have not been studied. This study aimed to explore the effects of Acacia honey (AH) on corneal keratocytes morphology, proliferative capacity, cell cycle, gene and protein analyses. Keratocytes from the corneal stroma of six New Zealand white rabbits were isolated and cultured until passage 1. The optimal dose of AH in the basal medium (FD) and medium containing serum (FDS) for keratocytes proliferation was identified using MTT assay. The morphological changes, gene and protein expressions of aldehyde dehydrogenase (ALDH), marker for quiescent keratocytes and vimentin, marker for fibroblasts were detected using q-RTPCR and immunocytochemistry respectively. Flowcytometry was performed to evaluate the cell cycle analysis of corneal keratocytes. Cultured keratocytes supplemented with AH showed no morphological changes compared to control. Keratocytes cultured in FD and FDS media supplemented with 0.025% AH showed optimal proliferative potential compared with FD and FDS media, respectively. Gene expressions of ADLH and vimentin were increased in keratocytes cultured with AH enriched media. All proteins were expressed in keratocytes cultured in all media in accordance to the gene expression findings. No chromosomal changes were detected in keratocytes in AH enriched media. 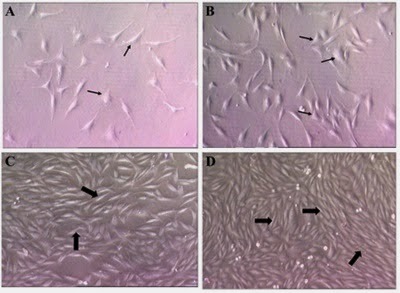 Corneal keratocytes cultured in media supplemented with 0.025% AH showed an increase in proliferative capacity while retaining their morphology, gene and protein expressions with normal cell cycle. The results of the present study show promising role of AH role in accelerating the initial stage of corneal wound healing. Click here to download the complete study.